"Lekkerbek" consists of "lekker", which means good (as in "tasty") and "bek", which means "beak" (for a bird) or "mouth". "Bek" is mostly used informally or in a vulgar way, check out the example with the Related words. "Lekkerbek" is the popular name for codfish wrapped in dough and deep-fried, but is also used for someone who really appreciates food. The Dutch word for codfish is "kabeljauw". – "In Scheveningen kun je het hele jaar door lekkerbekken eten." – "Hij is een echte lekkerbek, hij eet het liefst de hele dag." – "Het eten in dat Thaise restaurant is superlekker." – Bek: beak [noun] [de bek, de bekken]. – "Ik word helemaal gek van je; houd je bek!" – Mond: mouth [noun] [de mond, de monden]. DWOTD to it. 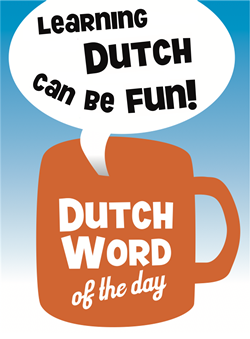 Check the DWOTD "Lekker belangrijk" to get started. I very much enjoy the DWOTD and the website and find it very useful. In a spirit of giving something back, I think that ‘batter’ would be a better English translation than ‘dough’ to describe the thing in which the fish is wrapped and then fried. Alen, thanks! What about a “deep-fried battered codfish” – would that work? I think a most people would simply say ‘deep-fried cod’. In the UK deep-fried fish is almost always dipped in batter first. And it would be usual to say ‘cod’ rather than ‘codfish’ which is technically correct but sounds incrediby old-fashioned. The batter would get a mention if it was special in some way – a popular variation on ordinary batter is to use beer and this would rate a mention, for example.